The new model Olympus is introducing has real MPEG4 with sound on board. 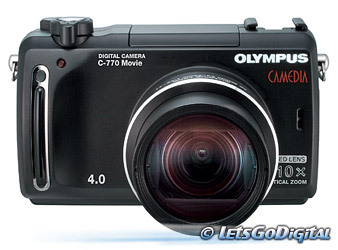 The 4 million pixel digital still camera Olympus CAMEDIA C-770 Movie is not only equipped with a powerful 10x optical zoom, it can also records full-screen quality MPEG4 movies with sound. This new feature allows television screen presentations and gives the user a perfect combination of both digital still camera and camcorder. The new C-770 Movie records a full-screen movie with a rate of 30 frames per second in MPEG 4 quality. The new flagship in the Olympus Ultra Zoom range features a bright (f2.8 - 3.7) 10x optical zoom lens which comprises eleven elements arranged in seven groups. In addition, it includes two aspherical lenses to reduce distortion, plus an ED element which helps to minimise chromatic aberration, an effect that often occurs when shooting in the tele setting. In combination with a 4 million pixel CCD, this high precision optical system ensures pictures of great quality, even when printed in larger sizes. Thanks to the PictBridge standard, direct printing can be carried out with compatible printers, eliminating the need for a PC. This new Olympus model offers a broad palette of shooting modes, including Shutter Priority, Aperture Priority and Full Manual settings. The camera's range of scene programs (Portrait, Self Portrait, Night Scene, Sports, Landscape and Landscape with Portrait) proves extremely convenient when there is less time for adjustments. Thanks to the USB 2.0 AutoConnect interface, pictures and movies can be downloaded quickly and easily to the computer. A host of additional features includes a hot shoe for an external flash and an optimised electronic viewfinder for 100% precise framing. Its 240,000 pixel resolution means that a clear picture is shown every time. As an added convenience, all activated settings are displayed in the electronic viewfinder, allowing you to keep your eye on the subject at all times. For handling the files, two software packages are included. CAMEDIA Master 4.2SE software allows easy optimising, editing and managing of the image files, and Ulead VideoStudio7 SE Basic is included to edit and watch the MPEG4 movies on your computer. The CAMEDIA C-770 Movie main features are: 4.0 million pixels, 10x optical zoom with ED lens (equiv. 38 - 380mm on 35mm camera), f2.8/3.7, Full-screen (640 x 480 pixels) MPEG4 movie recording at 30 fps with sound, Program, Shutter Priority, Aperture Priority and Full Manual modes, Hot shoe, 6 scene programs (Portrait, Self Portrait, Night Scene, Sports, Landscape and Landscape with Portrait), Supplied with 128MB xD-Picture Card, PictBridge compatible, USB 2.0, 1.8-inch LCD with multi-language menu and CAMEDIA Master 4.2SE plus Ulead VideoStudio7 SE Basic are provided with the camera. Altogether, the C-770 Movie allows extremely versatile and comfortable shooting, exceeding the expectations of even the most discerning photographer. This model will be available from April 2004.